Sometimes you've gotta do it yourself. Yessss. 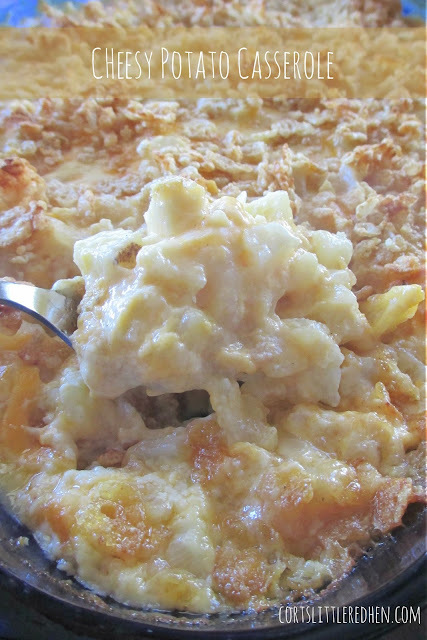 It is finally December so I can share my recipe for cheesy potato casserole, better known as funeral potatoes, around my neck of the woods. Why did I wait until December to share it? Because I guarantee you'll have to go to some sort of party or potluck in the next month, and you'll have to bring a side dish. Or, you'll be planning Christmas dinner and ask yourself, "What tastes good with ham?" Or you'll be wondering what to do with those left-over baked potatoes from last night's dinner. 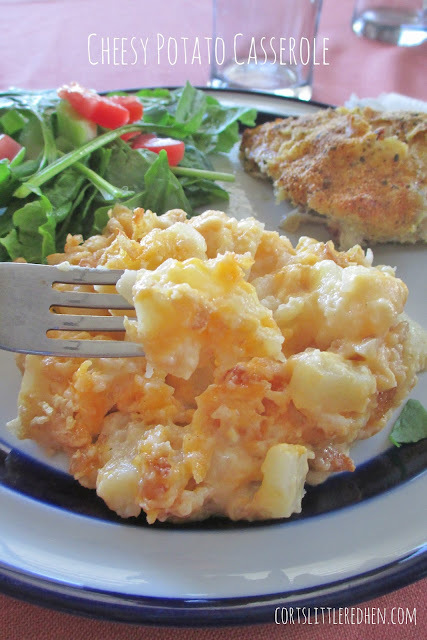 See, lots of reasons to share my recipe for cheesy, delicious potatoes in December. Some of you may be wondering why I call them funeral potatoes. Well, it is very common that when someone passes away the church in my area and the people in my neighborhood will supply a luncheon for the family of the deceased after the internment. While the church may provide the ham, we sign up to bring salad, rolls, desserts, or cheesy potato casserole, AKA funeral potatoes. Frankly, they are the best. Of course, I don't only make funeral potatoes for funerals! They are the perfect side dish for chicken and ham dishes. They typically show up on my table around Christmas, Easter, and for the occasional Sunday dinner. Creamy, cheesy, buttery, comforting, warm, they are difficult to stop eating and are a crowd pleaser. There are as many variations to this recipe as there are covers of "Sleigh Ride." Topped with corn flakes, sans corn flakes. Shredded hash browns, or southern style. My mom and I often like to make a southwestern version by adding diced green chiles to the cheesiness. But, I must say my mother-in-law, Yvonne, makes a really outstanding batch of funeral potatoes, loaded with cheese and made with real baked potatoes. I think this is a key secret to a successful batch of funeral potatoes. I'll admit, I normally use frozen hash browns, but actually baking the potatoes, peeling them, and then chopping them makes a world of difference. Yvonne finely dices her potatoes with the precision of a surgeon, but when I chop them they just turn into odd shaped lumps of potato. Here's the deal though- most recipes for cheesy potato casserole, or funeral potatoes, use canned condensed soups. I don't love that. And I ran out of sour cream. And I didn't have corn flakes so I had to use Special K. But I wanted funeral potatoes, so what's the Little Red Hen to do? Do it myself! Make something new! And I did, and it ROCKED, and my family loved it, and I'll never go back. So, try it out. Cheesy potatoes made with a homemade white sauce and Greek yogurt for some extra protein and creaminess! And it only takes an extra 5 minutes? And your family will eat it? Yes, please. Preheat oven to 350 degrees. Lightly grease 9x13 pan. 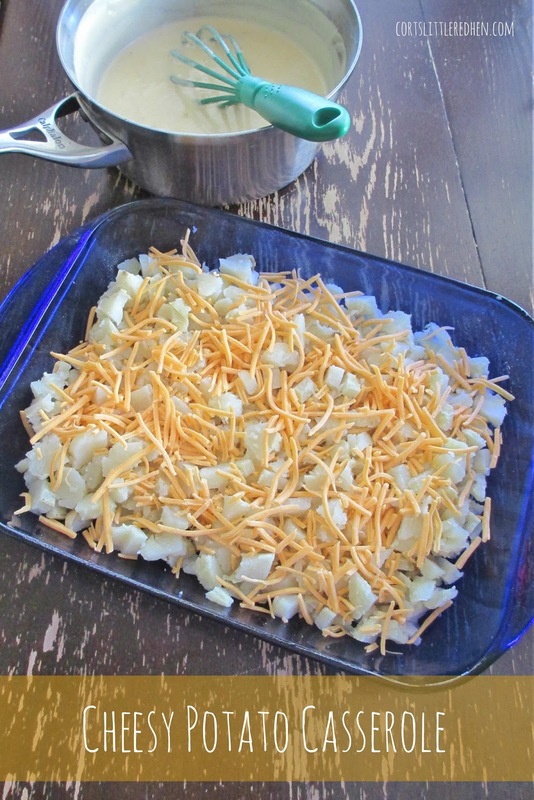 Fill pan with chopped potatoes. In a shallow pot, melt butter over medium heat. Add onions and saute until softened, about 2-3 minutes. Briefly remove pot from heat and whisk in flour. Slowly whisk in chicken broth and milk. Return to heat and stir continuously until sauce thickens, about 5 minutes. Toss corn flakes with melted butter. Sprinkle over cheesy potatoes. Bake for 30-40 minutes, or until hot and bubbly. Serve immediately.